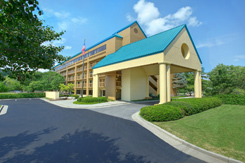 All rooms at Econolodge Riverside are "Petite Suites," 100% smoke free. 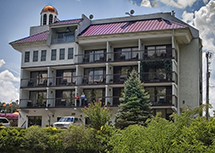 This Pigeon Forge hotel offers Free deluxe continental breakfast, refrigerator, microwave, data port telephones, in-room coffee makers, cable TV with HBO/Disney/ESPN, indoor pool, hot tub, outdoor courtyard, in-room movies and Nintendo 64 available. Special kid's suites with bunk beds. 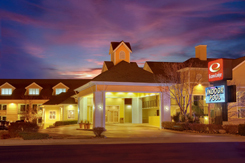 Elevator and handicap rooms available, some deluxe suites with heart-shaped Jacuzzi. Riverfront with walking trails and picnic area. Free high-speed Wireless Internet. This brand new motel offers free deluxe continental breakfast, interior corridors, refrigerator, microwave, electronic door access, in-room coffee makers, cable TV with ESPN and Showtime, in-room movies and Nintendo 64 available, indoor pool, hot tub, sun deck, special kid's suites with bunk beds, elevator and handicap rooms available. Deluxe suites with fireplaces, Jacuzzis, and balconies available. Free high-speed Wireless Internet. 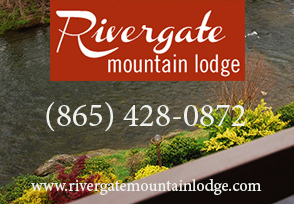 Situated on the Little Pigeon River in the heart of Pigeon Forge, Rivergate Mountain Lodge is family owned and in walking distance to the Old Mill Historic District, the LeConte Center and many shops and restaurants. All rooms have everything you need to have a great stay & wonderful vacation! So clean comfy & cozy you feel right at home! The lodge offers private parking and a garage for your motorcycles & bicycles. © 1997-2019 Image Builders. All rights reserved.